Trixie is stunning.. She is about 2 yo. 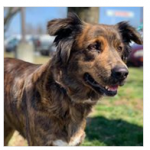 She has the catahoula mix brindle coloring, but has the ears and face of a border collie. We would love whoever is lucky enough to adopt her to do a DNA test on her. 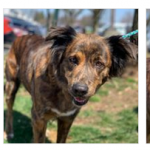 It would be cool to find out what she is mixed with..
Trixie is good with other dogs, and loves all people. Cats are unknown..